Quite simply, Muhammad Ali had it all. The best boxer in the world during a golden age of heavyweights, he was an unrivalled showman with an electrifying fighting style, which he used to back up his outrageous – but extremely poetic – trash talk. Ali thrilled against Frazier in Manilla, rumbled with Foreman in the Jungle and captivated audiences around the globe during his three world championships reigns. But despite achieving such legendary status inside the ring, nearly four decades after his retirement, the man formerly known as Cassius Clay is equally beloved and respected for his actions outside of it. Clay formally changed his name to Ali in 1964, having converted to Islam and joined the Nation Of Islam – a religious movement who campaigned for the social and economic rights of African Americans in the U.S. and abroad. It was a forthright move for the newly-crowned heavyweight champ, fresh off his upset win over Sonny Liston and firmly in the media spotlight at a time when America was gripped by racial and religious tensions, fuelled by the rise of the civil rights movement. When Ali became eligible for the Vietnam War draft three years later, he promptly refused to enter, declaring himself a conscientious objector and arguing that racial inequality at home was his enemy, not the Viet Cong people. This principled stance led to him becoming a figurehead for the growing anti-war movement, but it came at a heavy cost to his athletic career. 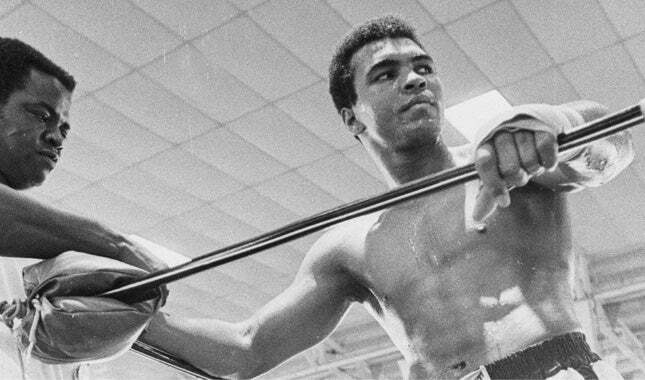 After refusing to be conscripted, Ali was promptly arrested, convicted and – facing up to five years in prison and a $10,000 fine – systematically stripped of his world title, boxing licenses and passport by the American authorities, effectively denying him the opportunity to compete anywhere in the world. He was eventually able to get the verdict overturned on appeal by the U.S. Supreme Court in 1970, but the lengthy legal process forced him to sacrifice three-and-a-half prime years of his career – during which he earned a living by making public speaking appearances at American college campuses. And although he went on to recapture the world title twice following his return – against George Foreman in 1974 and Leon Spinks in 1978 – he was never the same fighter, as age gradually robbed him of his previously mesmerizing footwork, exemplified by the trademark “Ali shuffle”. The Muhammad Ali At The O2 exhibition is opens on 4 March 2016.